FORTUNE -- What happened to the smiley face? It's long gone from Wal-Mart marketing after years as the corporate symbol, and its disappearance is part of a much larger story. It's hard to believe, but for decades the world's largest retailer wasn't much of a marketer. It spent little on marketing, and its efforts, epitomized by the grinning circle, could be charitably called down-home and realistically described as amateurish. 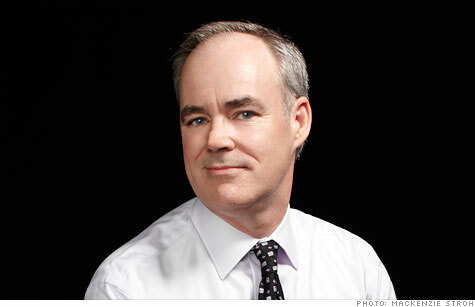 Change finally began four years ago when Stephen Quinn was made chief marketing officer of Wal-Mart U.S. He exiled the smiley face to the land of e-mail emoticons and developed a new theme -- "Save money. Live better" -- that became a statement of corporate purpose. Current TV commercials actually include some wit while hammering home the message. Q: Overall retail sales were up smartly over Thanksgiving weekend. What did Wal-Mart's experience tell you about the state of the U.S. consumer? A: It really fits with a trend we've been seeing for several years, which is that customers have become incredibly smart about how to save money. All our research is showing that the number of people looking to save money is at an all-time high, at least in our lifetime. What we're seeing on the big shopping weekend around Thanksgiving is just a lot of people in there trying to get deals. That ties into something you've talked about before, which is that the U.S. has an hourglass economy. What's that concept? The population is bifurcating. Some people have said we're seeing the middle class being hollowed out a little bit. In the lower half we're seeing real incomes dropping -- that's been well reported. One of the more tragic pieces of that is that at the very bottom we're actually seeing poverty rising in this country. A lot of those customers in the lower half would absolutely fall into our core customers. So it's critically important that we serve those customers very well as they go through a challenging economic time. A challenge for retailers is that at the other end of the spectrum people are doing relatively well. Unemployment is under control, and those people are even seeing some income growth. A lot of folks in that other half of America are looking for certain products that we've got to carry, but they're still very value-oriented. That's an overall theme -- there is still an ethic of value that may have changed forever, based on this recession. That's a big marketing issue. You've got to communicate with both ends of the hourglass. How do you do that? A lot of retailers used to be defined by what they sold. More and more -- and we're certainly an example of this -- retailers are defined by whom they serve and how they serve them. In our case, the people we serve are value-oriented. We've done a lot of segmentation studies and other work, and we've learned that there obviously are people who have to be on a budget, and Wal-Mart plays a critical role in helping them stretch their dollars. But there are also a lot of people who just love to save money, and some of them are actually quite well off, but it's still important to them to save money. With those customers, the key is to have the merchandise they really want to buy. They still want to save money on it, but you've got to have it. That's why, in areas like our general-merchandise area, we're expanding assortments to make sure we can appeal to both groups of customers. What's an example of expanding the assortment to broaden the appeal? Several years ago we really reduced our fishing area, and it hurt us. In the past 18 months we've dramatically improved the assortment we have there -- many more price points, a lot more brands have been added -- and then we've really focused on communicating that to customers. And we've seen a real dramatic turnaround in that business. Perhaps in this economy people are looking at more ways to just spend quality time with families. Fishing is a very inexpensive pastime, and we've really benefited from that expanded assortment. We've got numerous examples of this, done or in progress, across the store. More broadly, Wal-Mart reduced the number of items it carried store-wide a few years ago -- the decluttering initiative -- because it appeared that's what customers wanted. Now you're bringing the items back, thousands of them. What's the lesson to take out of that experience? The thing that's great about retail is that if you get the assortment right and the value right, customers do respond. In our case, people are in our stores, and it's really up to us to make sure we have the right stuff for them. What we've learned through this whole recession is just how incredibly resourceful and smart our customers are. Certainly we made some mistakes in assortments where we overly reduced them, more from an efficiency standpoint, and it ended up causing customers to shop elsewhere. Fortunately for us, there is some forgiveness there, because as we've put some of those things back -- fabrics were a very well publicized example of an area we really reduced -- the customer is responding dramatically. It's clear that value has to be the heart of your messaging. What have you found really works? Our messaging really falls into two categories. My boss, Bill Simon, CEO of the business in the U.S., talks about how we have the broadest assortment, at the lowest prices. From an advertising and communications standpoint, my job is to make sure that, first and foremost, people have trust and confidence that we have the lowest prices, and that we have the assortments they're looking for. It's challenging because we have to communicate things like, when we put this fishing assortment back, that in fact it is back, that we've got the brands you're looking for and you can trust us to have the right assortment. A lot of shopping is very habitual for customers, so if they stop thinking of us as a place for fishing, as an example, they may not even look over there anymore. What's the meaning of the Wal-Mart brand, and what have you learned about where it works and where it doesn't work? Most of my background before I came to Wal-Mart was in building brands, and one of the things I help bring to Wal-Mart is thinking of the company not just as a company but also as a brand. We relaunched the brand four years ago based on something Sam Walton said, that if we work together, we'll give the world an opportunity to see what it's like to save and to have a better life. In the marketing department we worked on taking those words and crafting them into our purpose, which is to save people money so they can live better, and you see that in our advertising save money, live better. Fundamentally, this is a brand that has a purpose, and our associates are very committed to making sure we can save people money so they can live better, and that's the main vector of marketing communication we have. More important, it's become everybody's job to own that, and that's one of the big differences between a retailer and a packaged-goods business like I came from, where you're managing a brand image. As a retailer you're interacting with millions of customers every day, and how you interact with them becomes your brand to the people you serve. So the brand has been critical to getting everybody on the same page about who we are and what we do, and then my job is to communicate that to customers. Same-store sales in the U.S. were down for nine quarters in a row, but in the most recent quarter they went up. While the economy is better than it was, it still isn't great. What's the explanation? What I'm most proud of in the last couple of years is that it has not been an external change that has helped us move into positive territory in comp-store sales. Our leader, Bill Simon, and Mike Duke, our CEO, really drove us to get back to the core basics of what Wal-Mart stands for and the families we serve. We had to take a look at assortments, which we've already talked about; the reason to come to Wal-Mart for some people had been removed. And then, importantly, we did not watch our costs as closely as we should have, and we're back into making sure we lower our costs so we can lower our prices while at the same time serving shareholders. Everything goes well if you get that promise right at its core. You have more customers than any other retailer on earth. How do you sense what they want and need? A couple of ways. First is something unique to retailers, in that we have hundreds of merchants in our merchandising area, and each of them tries to think of their business as their own business, so they're constantly trying things. That's why you'll hear people talk about the data that Wal-Mart has. It's really data about sales, and as we are trying things, we're seeing the customer likes this, they want more of that; they really don't like this other thing, and we should probably do away with that. The insights-driving machine at the core of retail is the ability to look at our data and bring some kind of meaning to that. The second way is more traditional, and that is market research. We've amassed an enormous amount of data. Like almost everybody, we're trying to figure out how to get all that data into the same place so we can see how these data interact with each other. And that includes some of the newer areas like social media, where we've got almost 11 million Facebook fans, and they're constantly giving us feedback because that's the very nature of that medium. How a retailer uses social media has become a huge issue. When people go to an e-commerce site from a Facebook page, they're twice as likely to buy something than if they go there some other way. Is there a way to use this to build sales? Absolutely. We're obviously looking at the interaction between Facebook and our social media strategy, and how that ties into our e-commerce, which is one way we can trigger sales. But more important for us is how we use that to build communities, even local communities, around our stores. We're a retailer that is very committed to our stores, our bricks and mortar. How do we reflect that in how we interact with people on Facebook and in social media, and how does that translate into doing a better job at the store level? You've just launched 3,500 new Facebook pages for individual stores. Right, and that is based on this commitment to local communities. It's a little clichéd, but people talk about retailing being fundamentally a local business. As a customer, what you experience is your Wal-Mart and the other retailers you can choose from. So how we interact at a local level is really important to us, and that's why we've launched these local Facebook pages. Our goal is to integrate into the things that are happening in a local community and to make us better merchants through that. What's some non-Wal-Mart marketing that you admire? The marketing I really admire is marketing that goes beyond an advertising message. McDonald's (MCD, Fortune 500) has done an unbelievable job over a long period of time. As we're seeing their beverage strategy emerge, it's really impacting customer behavior in terms of the frequency of trips. I love that, because it's a marketing insight into the customer that ended up changing what the company did. Hyundai is another example. You may not have to be a genius marketer to communicate the Hyundai assurance guarantee, but where did that idea come from? What a great idea for customers. One of the things I look for at Wal-Mart is how we do marketing that makes a difference in the lives of customers and doesn't just build an image. Way past. In fact, if you have something compelling enough that will make a difference in the lives of customers, the marketing part of it, the communication to customers, is relatively easy. There's only one major U.S. market that Wal-Mart isn't in, and that's the one we're sitting in right now, New York City. What's the plan? I can't really let you in on the specific plans in New York. We want to serve customers here. It has become a pillar of our strategy to give people more access to everyday low prices, and that includes being much more flexible about the kinds of formats we're willing to put the Wal-Mart name on and how we're working with cities to find a way to serve those customers. If a young person told you that he or she wanted to become the chief marketing officer of a big corporation, what would your advice be? First, it starts with the customer. You've got to be incredibly customer-focused nowadays because -- it's been said many times -- the customer is in control. All the technology and the societal trends we're seeing point to that control just growing and growing. Second, marketing ought to be active inside the organization at breaking bureaucracy and getting the company to serve customers, to do the things we need to do to be successful with the customer. Way too many marketers get focused on the advertising and the marketing communications messages, even if all that is becoming more complex today with social media and so on, and they don't play enough of an activist role inside the company to get the company to do the things we know we have to do to be successful for the customer. The Leadership Series: Formerly called "C-Suite Strategies," this is the latest interview with a top executive by Fortune senior editor-at-large Geoff Colvin. See video excerpts of this interview at fortune.com/leadership -- plus find Colvin interviews with Charles Schwab, the team of Jeff Immelt (GE) and A.G. Lafley (P&G), Pimco's Mohamed El-Erian, Harry Brekelmans of Shell, Nils Andersen of Maersk, and many more.